Griffith, Clay, and Susan Griffith. Vampire Empire: The Greyfriar . Pyr 2010. What if: Vampires overran the northern mid-latitudes in the late 19th century. Series note: Originally a trilogy including The Greyfriar , The Rift Walker , and The Kingmakers , but additional related volumes are to follow, beginning with The Geomancer . 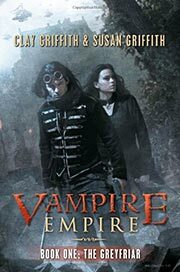 Series note: First volume of Vampire Empire. Published: Pyr 2010 (1616142472w88 android). Series note: Second volume of Vampire Empire. Series note: Third volume of Vampire Empire. Series note: Fourth volume of Vampire Empire.